With striking style and a compact size, the Metropolitan Bar Cart from Inspire Q is functional and chic. Clean and simple with a touch of mid-century glam, this piece is sure to make a statement with your guests. Uncomplicated lines and a chrome finish create a sleek, modern look that will match an array of contemporary design schemes. 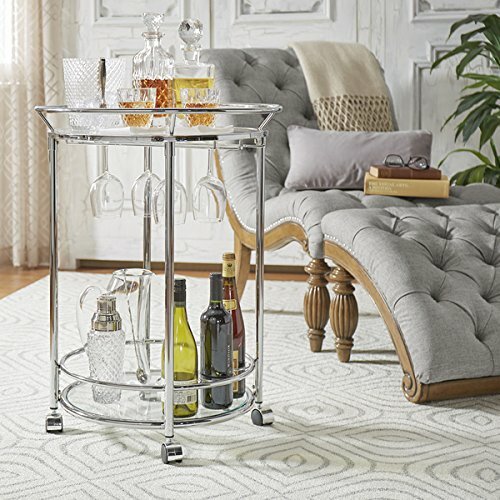 With plenty of space for pouring and mixing drinks, this convenient bar cart is a hosting essential for any occasion. If you have any questions about this product by Inspire Q, contact us by completing and submitting the form below. If you are looking for a specif part number, please include it with your message.